Introducing the BaseHead Player Engine! 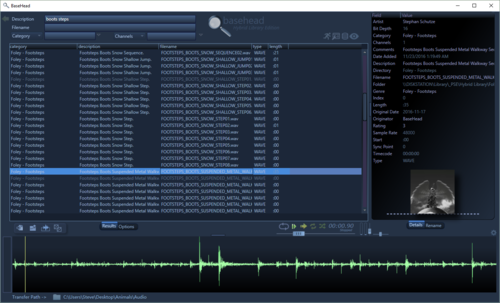 The BaseHead Player Engine is a custom branded version that can be used by SFX and Music Library creators to embed on the same hard drive they ship their library or include in their download pack. There is no installing or registration codes needed for your users to immediately jump right into your creations. Just Launch It, Search It, Audition It, and Drag and Drop It to your DAW! It’s basically BaseHead Lite with a few minor changes. One single internal hardwired database of your files. 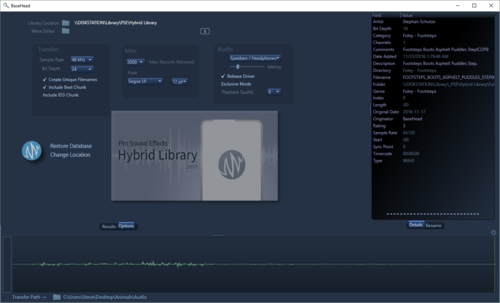 Belowt is the Start screen of the Pro Sound Effects Hybrid Library running on the BaseHead Player Engine. 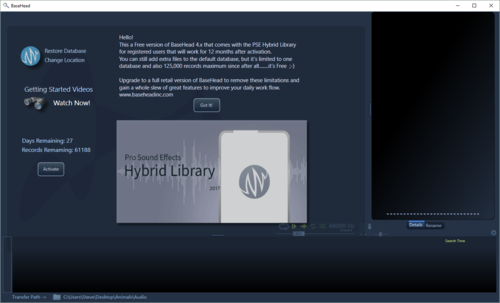 Here’s an example how PSE is using the BaseHead Player Engine with the 2017 Hybrid Library on THIS PAGE and to the right is a video of David from Pro Sound Effects showing how easy it is for your users to dive straight in once they receive your hard drive or download pack with the BaseHead Player Engine Embedded! Pricing: There is a one time setup fee of $500 (per platform) to create the custom branded version with your logos and a database for your files for both PC and or Mac. Also we have to change the text to match your company throughout the program. Then based on the amount of projected installs and size of your library, a yearly subscription fee will be charged also to keep the service going. Interested? The send us and email to talk details. Let us know the size of your library (in records) you’d want to use this with and amount of users you expect to ship your library to per year and we can talk pricing details.